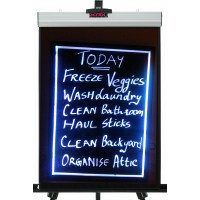 Eye catching and attention grabbing, the LED Chalkboard is a creative and updated alternative to the chalkboard. The LED display and neon signage will illuminate your shop window or front in an eco-friendly way while allowing you to wipe away and rewrite as you choose. 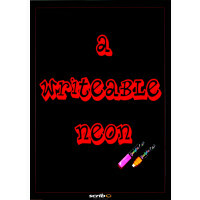 The marker pens provided have neon pigments in the ink and this, combined with the LED lighting technology makes for an innovative and exciting substitute for the outdated chalkboard. 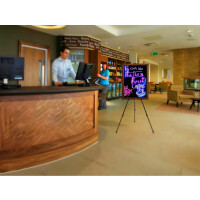 LED Chalkboards offer a unique and striking way of promoting your brand or business through its LED writing board and easy display. 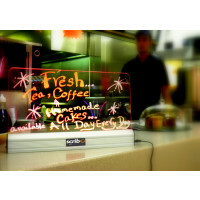 Customers will immediately be drawn to the offers your business is advertising as a direct result of our LED Chalkboard. This easy to use and pocket-friendly product has the potential to increase your businesses’ customer base through a bright and personalised display. All of this makes the LED Chalkboard an excellent sale boosting tool. The writing board is available in many different forms depending on what you require including framed, counter-top and wall hung. It is a brilliant tool for pushing your businesses visibility and awareness. LED Chalkboards offer creativity, personalisation and an easy way to exhibit information; they allow you to build a close and special relationship with your customers through the rewritable neon display. 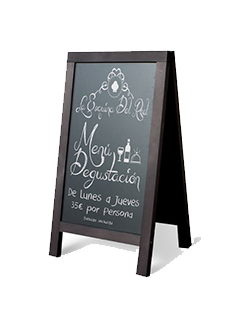 The simplicity of this product is what makes it so effective; where chalkboards can be difficult to clean and write on, LED chalkboards are easy to use and wipe down, thus providing your business with versatile and adaptable means of promotions and advertising. All in all, these reusable, neon-like chalkboards have the potential to greatly benefit your brand or business through eye catching, modern and personalised signage. Feel confident that this advertisement tool will be what brings your company an edge over the competition.